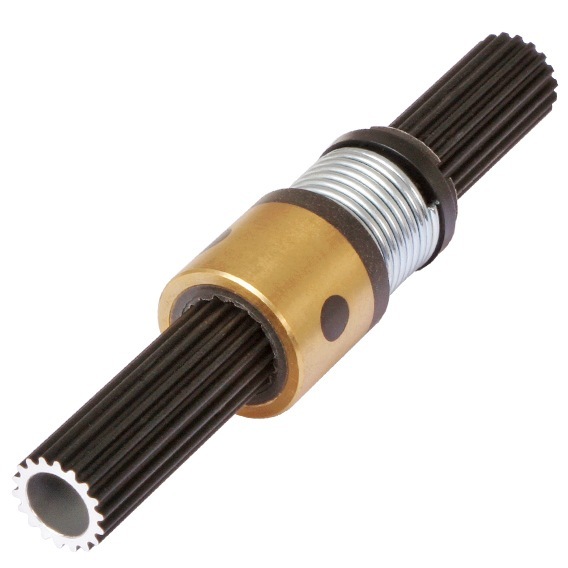 The SZ Series Spline shafts are available in 5 sizes from 1/8” to ¾” (3.18 to 19mm) diameter. Bushings are available in either a plain or threaded interface, both with anti-backlash compensation. SZ 02 3.18 0.45 2 Spline, anti-backlash, light to moderate loads, low cost, low friction, and long life. Kerk Spline Shaft SZ assembly consists of a stainless steel spline shaft treated with Haydon Kerk Motion Solutions™ proprietary low friction Kerkote® TFE coating, mated with a Kerkite® composite polymer bushing.